My version is different because rather than just sauteing in garlic and onion with some beef slices, I added some ingredients typically found in Chinese cooking. I was never a fan of ampalaya growing up, but knowing that it is good for you, might as well tweak it so my kids will somehow develop an acquired taste to it. I cut the ampalaya and put coarse salt generously(just like in pickling), set aside for at least 30 minutes to sweat its (bitter)juices. Then I rinsed off the salt with hot water. However, if you prefer it to be 'as it is' - bitterness and all, you can skip the salting part. I sauteed it with beef, seasoned with oyster sauce with star of anise, ginger, and a little bit of brown sugar. 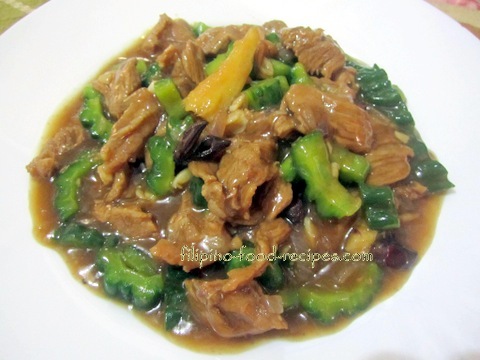 Here’s my take on Ampalaya con Carne which I hope you will try soon. 1 Put the sliced ampalaya on a colander, then put the salt. Set aside for 30 minutes. (notice than some of its juices are draining in the colander). 2 Rinse the ampalaya by pouring hot water, then squeeze the excess liquid. Set aside. 3 Boil the beef in 1 1/2 liters of water with 1 pc onion, half of garlic head, 3 pcs. star of anise, soy sauce and half of the ginger for an hour or until tender. Set aside. 4 Saute remaining garlic, onion, ginger and star anise. 5 Add the beef, oyster sauce, brown sugar and ground pepper. 6 Mix in the ampalaya, saute for a little bit and add 2 cups of the broth from the cooked beef. 7 Simmer for 10 - 15 minutes or until ampalaya is tender, then add the slurry to thicken the sauce. 8 Serve hot with steamed white rice.